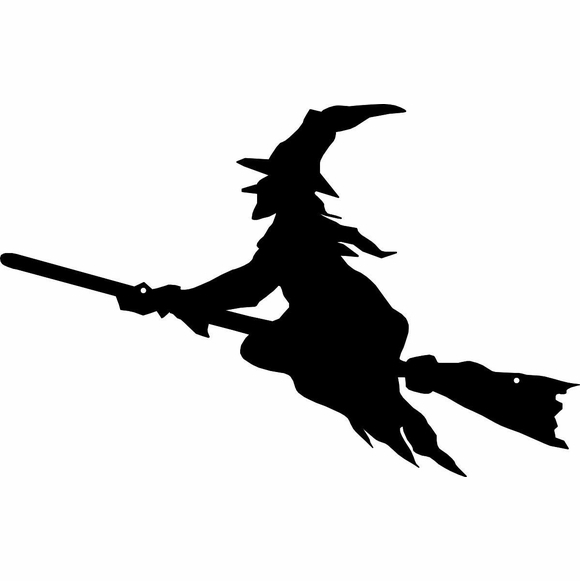 Halloween Witch on Broom Wall Art - - is a special fun addition to your Halloween decor. Made in USA. Liven up your wall with our not-so-scary witch riding on a broomstick. Two sizes: approximately 12"W x 7.75"H and 23"W x 14.75"H.
Made from 1/8" modified, non-rusting, UV-inhibited acrylic. Select one of 12 colors: traditional black or non-traditional red, burgundy, yellow, pine green, blue, ivory, white, grey, brown, and charcoal. Hang on your front door to welcome Halloween party guests or use as indoor wall art. Includes two 1/8" mounting holes and stainless screws. Black 100 percent natural hemp hanging cord also supplied. Halloween Witch on Broom Wall Art is a special fun addition to your Halloween decor.